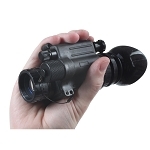 The Firefield Tracker 1x24 Night Vision Goggles allow for incredibly detailed observation ability under the darkness of night that includes a head gear accessory for a flip-up, adjustable and hands-free unit. 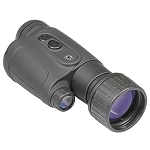 The Tracker 1x24 provides clear viewing in total darkness by utilizing a built-in IR infrared illuminator; when in use the illuminator emits a pulsing frequency that is so energy efficient it creates less battery drainage and prolongs battery life. 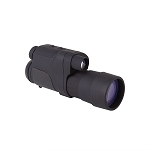 The ergonomically designed rubberized body is surprisingly lightweight and can be taken on long expeditions both easily and comfortably, and is great for prolonged use with the head gear accessory. 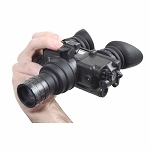 The Tracker utilizes the revolutionary Eclipse Lens Cover System which uses flip-up covers that can be easily clipped back against the body of the binoculars and rotated out of the user's viewing area while eliminating lens cap hassles. Pin holes in the lens caps allow the Tracker to be used in the daytime when the caps are closed. 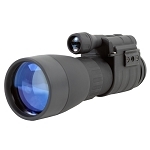 Also featured is a dual diopter adjustment with central focusing knob and fully multi-coated optics.